By and large, all WordPress plugins will work on your network. There are, however, some special plugins and some special considerations for using plugins with a network. Browse to the Plugins page on your WordPress Network Admin Dashboard by clicking the Plugins link under the Plugins menu. You find that the Plugins page, but if you don’t know where to look, you can easily miss one very small, subtle difference. Have a look below the name of the plugin. Do you see the Network Activate link? That is the big difference between plugins listed on the regular Dashboard and those on the Network Admin Dashboard. As the Network Admin, you can enable certain plugins to be activated globally, meaning across your entire network. This means that all sites in your network will have the network activated plugin features available on their site, in contrast to plugins that you activate on the regular Dashboard (under Site Admin), which are activated and available only for your main website. 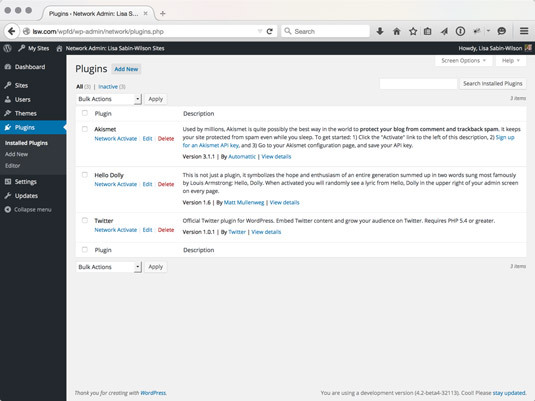 If you select the Plugins administration menu on the Network Settings page, users see the plugins listed on their Plugins page on their Dashboard. In their list of plugins, they see only the plugins that you have not network activated; that is, they see a list of all the plugins you installed in your WordPress installation, but none of them are activated on that user’s site. Users have the ability to activate and deactivate those plugins as they desire. Only the Network Admins have access to install new plugins on the site; regular users within the network do not have that kind of access (unless you’ve made them Network Admins in their User settings). Also located in the Plugins menu on the Network Admin Dashboard are two other links: Add New and Editor. The Add New link lets you add and install new plugins by searching the WordPress Plugin Directory within your Dashboard, and the Editor link gives you access to the Plugin Editor.